BURWASH, NATHANAEL, Methodist minister, theologian, educator, and author; b. 25 July 1839 near St Andrews (Saint-André-Est), Lower Canada, eldest of the six sons of Adam Burwash and Anne Taylor; m. 25 Dec. 1868 Margaret Proctor in Sylvan, Ont., and they had four daughters and eight sons; d. 30 March 1918 in Toronto and was buried in Baltimore, Ont. Nathanael Burwash’s great-grandfather and namesake had settled in Vermont just prior to the American revolution, but had been compelled to leave because of his loyalist sympathies. In 1802 he acquired a 1,000-acre tract near St Andrews, where a grandson, Adam Burwash, in 1838 married Anne Taylor. In 1844 Adam and Anne moved to Upper Canada to a modest farm near Baltimore with their two sons, Nathanael and John, and Anne’s parents. Influenced by the intense piety of his parents, who were both converts to Methodism, and by their concern to give their sons a higher education, as well as by the example of an uncle, Lachlin Taylor, a prominent Canadian Methodist minister, Nathanael enrolled at Victoria College in nearby Cobourg in 1852 as a preparatory student. In 1855 he left for one year to teach in an elementary school in order to help defray the costs of John’s education. 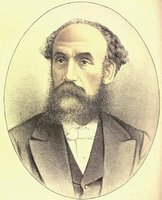 Nathanael graduated with a ba in 1859, winning the Prince of Wales Medal, and then spent an additional year at Victoria as a tutor in the preparatory department. Burwash’s years at Victoria were profoundly important for his intellectual and religious life. In December 1852 he had experienced conversion, and in the following term he took part in a large-scale revival at the college and became a member of the Wesleyan Methodist Church in Canada. Naturally devout and serious, he benefited greatly from the liberal leadership of Victoria’s president, Samuel Sobieski Nelles*, whose ability to balance religion and learning by drawing on Methodist spirituality and Scottish common sense thought would remain a model for Burwash. Granted a licence to preach on the Cobourg circuit in 1859, Burwash completed a probationary year in Newburgh, and in 1861 was received on trial into the ministry. His subsequent appointments to Belleville (1861–63), Toronto East, where he was ordained in 1864, and Hamilton (1865–66) were unusually prestigious for a young minister. They also allowed him to make valuable contacts with future benefactors of Victoria College, most notably William Gooderham* in Toronto, and Edward Jackson* and his wife Lydia Ann, with whom he boarded in Hamilton. 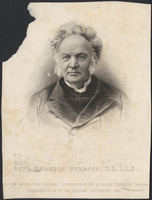 Moreover, as one of only a handful of college-educated Methodist ministers, Burwash quickly became involved in his church’s efforts with young people; in 1864 he joined Daniel Wilson* in the reorganization of the Young Men’s Christian Association in Toronto on a non-denominational basis, and in 1881 he became the association’s national president. He had briefly seen military service as chaplain in June 1866 at the battle against Fenian invaders at Ridgeway [see Alfred Booker*], for which in 1912 he would be gazetted an honorary lieutenant-colonel. Notwithstanding a lack of formal qualifications, Burwash was asked in 1866 to return to Victoria to fill the chair of natural science, which had become vacant in 1864. With the financial assistance of Edward Jackson, Burwash spent a few months at the Sheffield Scientific School at Yale College in Connecticut, and assumed his duties early in 1867; that year he also received an ma from Victoria. He would provide conscientious if not brilliant instruction in chemistry, physics, biology, mineralogy, botany, and geology, while gaining a reputation for openness to new scientific thought. At Yale he had been able to attend chemistry lectures given by Benjamin Silliman, a proponent of the inductive method of reasoning of Francis Bacon, which for many American evangelical academics offered a way to overcome the difficulties confronting faith as a result of new scientific knowledge and biblical criticism. Through its distinction between “facts” and “speculations and theories,” Baconian science allowed Burwash to refrain from taking a position on such controversial questions as the theories of Charles Darwin on evolution, without calling into question his religious convictions. In December 1868 Burwash married Margaret Proctor, a graduate of and briefly a teacher at the Wesleyan Female College in Hamilton, and for one year preceptress at the Mount Allison ladies’ academy in Sackville, N.B. A quiet, strong-minded woman, she shared Nathanael’s interests in religion and education. They bore the profound loss of eight of their twelve children at a young age, including three sons and a daughter to diphtheria during a single week in June 1889. Two of the other sons, Edward Moore Jackson and Lachlan Taylor*, would share their father’s interest in science and write works on the geology of Canada. Nathanael Burwash’s own concerns led him to view the teaching of the natural sciences only as a stepping-stone until a faculty of theology was established at Victoria. As a young minister in Belleville he had briefly undergone an intense crisis of belief, which left him with a lasting desire to help others meet the challenge posed to faith by the new currents of thought. Convinced that the training available on the circuit to candidates for the ministry was no longer adequate, in Hamilton he had offered theological instruction to a small group of men. At Victoria, in addition to his courses in the sciences, he taught a number of subjects in theology as part of the arts program. In 1870, anticipating the establishment of a faculty of theology at Victoria, he enrolled at the Methodist Garrett Biblical Institute in Evanston, Ill. He received a bd in 1871 (followed in 1876 by an std), and the next year assumed the chair in theology at Victoria endowed by Edward Jackson. With the further help of a legacy after Jackson’s death and the efforts of Lydia Jackson, Victoria established a faculty of theology in 1873, with Burwash as dean and professor of systematic and biblical theology. He remained as dean until 1900. With the death of Nelles in 1887 he had become chancellor and president of Victoria University, formed in 1884 through the union of Victoria College and Albert College in Belleville. Committed to fostering a harmonious relationship between religious faith and scientific thought, Burwash in his lectures in theology drew on the Baconian method which he had used in teaching the sciences. For him, Baconian science did not, however, become a defence of biblical literalism, as it did with teachers at some evangelical colleges such as Princeton. Instead, he slowly moved to a selective acceptance of higher criticism without abandoning the tenets of Methodist faith. The experimental evidence offered by Methodist spirituality, especially John Wesley’s doctrines of “the witness of the Spirit” and “Christian perfection,” which had played a critical role in overcoming his own crisis of faith, now became for him an important means to counter religious unbelief. Drawing heavily on classroom lectures, Burwash disseminated his thought in four publications which quickly became prescribed texts for ministerial candidates: Wesley’s doctrinal standards (1881), which is a study of Wesley’s standard sermons, Handbook of the Epistle of St. Paul to the Romans . . . (1887), Inductive studies in theology (1896), and the two-volume Manual of Christian theology on the inductive method (1900). The last, which built on 30 years of teaching, incorporated a growing awareness of the challenge offered to Christianity by other religions; in one of the many drafts Burwash addressed the concerns of Japanese Christians, who along with local native people were frequent visitors at his summer home at Go Home Bay in Muskoka. The Methodist denomination did not accept the new teaching at Victoria without debate, however, and Burwash during his presidency had to contend with two highly publicized controversies, the first, in 1890, centring on the advanced views on Messianic prophecy of George Coulson Workman*, professor of Old Testament, and the second, in 1909, involving George Jackson, a British Methodist minister who had been called in 1906 to Sherbourne Street Methodist Church in Toronto and who had recently been appointed professor of English Bible. Jackson, whose use of higher criticism for understanding the Book of Genesis did not differ significantly from Burwash’s, received strong support from some prominent Toronto Methodists, including Joseph Wesley Flavelle* and Chester Daniel Massey, but in the wider church a number of laymen and ministers, led by Albert Carman, saw his position as an attack on the foundation of the faith. At the General Conference held in Victoria, B.C., in 1910, Burwash drew on Wesley’s thought to argue, in the face of considerable opposition, that any attempt to limit Methodist ministers to a literal interpretation of Scripture was unorthodox and an innovation. He was successful: the new critical teaching was allowed to continue, and all future disciplinary cases were to be decided by a committee of trial composed of five ministers “of good repute for their knowledge of questions of doctrine” rather than by General Conference. As dean until 1900, as the only Canadian Methodist theologian of stature, and as secretary of the Educational Society of the Methodist Church from 1874 to 1886, Burwash assumed a leading role in upgrading the training of the Methodist ministry and in church committees. From 1874 he was instrumental in compiling the Methodist hymnary, completed in 1880. In 1889 he was elected president of the Bay of Quinte conference, which in 1913 was to establish the Burwash Memorial Lectureship at Victoria. When formal negotiations began in 1904 for the union of the Presbyterian, Methodist, and Congregational churches, he was appointed president of the subcommittee on doctrine and was able to exercise a decisive influence on the doctrinal statement in the Basis of Union issued in 1909; he was asked to present the reasons for union in a series of articles for the Christian Guardian in 1912. In keeping with an optimistic post-millennial reading of history, which saw Methodism at the vanguard of progress, he considered the union movement another step in his denomination’s mission to effect the moral and spiritual transformation of Canadian society. This same sense of mission had made Burwash eager to help shape the movement for university federation in Ontario, instigated in 1881 by William Mulock*, vice-chancellor of the University of Toronto. When negotiations began formally in 1884 between Victoria, the university and Trinity in Toronto, and Queen’s in Kingston, Burwash represented Victoria on behalf of Nelles. He played a critical role by successfully promoting his own proposal to assign instruction in theology and the humanities to the denominational colleges and to give the responsibility for the sciences and professional training to the university. With some modifications, this division of labour would be spelled out in the Federation Act passed by Ontario in April 1887 and would be for Burwash its cornerstone. He argued that by teaching the humanities and providing a nurturing environment, the colleges would be able to continue their traditional task of spiritual and moral formation; at the same time, the sciences, taught now without religious bias thanks to the triumph of the inductive method, would be emancipated from church control and assigned to a state-funded university. Moreover, because the colleges would be part of what he assumed would soon be Canada’s “national university,” federation was a crucial step in realizing the aspirations of earlier evangelicals such as Egerton Ryerson* to establish a non-sectarian Christian educational system. Federation was not achieved easily, however, and by 1886 only Victoria among the denominational colleges was considering it. Even among Methodists, opposition had become so strong that when the issue came before the General Conference of the Methodist Church in that year, Burwash voted in solidarity with Nelles against the scheme. The conference none the less accepted by a narrow margin the proposed terms of federation, which involved moving the college from Cobourg to Toronto, and the Federation Act was subsequently passed in the legislature. 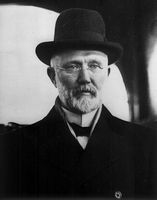 Continuing opposition stayed the scheme, but after he succeeded Nelles as chancellor and president in November Burwash came out in its defence. A $230,000 bequest from the estate of William Gooderham in 1889, conditional on the relocation of Victoria to Toronto, allowed the proclamation in 1890 of the Federation Act. Opposition to federation abated at Victoria only after it moved to its new building in Toronto in 1892 [see William George Storm*] and when evidence began to appear of the new chancellor’s ability to continue tapping the resources of Methodist philanthropists. The heirs of Hart Almerrin Massey* helped fund a women’s residence, Annesley Hall, opened in 1903, and a men’s residence, Burwash Hall, completed in 1913. Through his membership on the University of Toronto senate and in the Ontario Educational Association, Burwash exerted considerable influence on Ontario’s educational system. For example, he resisted efforts by institutions which had remained outside federation, such as Queen’s, to obtain government funding. In 1902 he was elected to the Royal Society of Canada, to which he contributed a number of papers, and in 1906 he became president of his section. 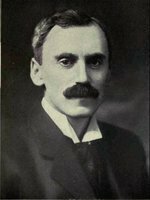 He was a charter-member in 1899 of the Canadian Methodist Historical Society, a member of the United Empire Loyalist Association of Ontario, the Canadian Defence League, the Canadian Society of Authors, and the Evangelical Alliance, and a director of the Canadian Peace and Arbitration Society. Reflecting a growing interest in preserving the Methodist past, he headed a fund-raising drive in 1910 to restore the old chapel at Hay Bay [see William Losee*]. He spoke frequently on university federation and Methodism in central Canada, subjects which led to the publication of Egerton Ryerson in the “Makers of Canada” series (1903), The history of Victoria College, which appeared posthumously in 1927, and the first three chapters of The University of Toronto and its colleges, 1827–1906. In part because he was troubled by chronic fatigue and in part because of a heated disagreement with Victoria’s more progressive dean of women, Margaret Eleanor Theodora Addison*, over hours of curfew at the women’s residence, he retired as chancellor and president in 1913. He continued to teach church history at Victoria and practical theology at the Methodist National Training School, an institution for women entering missionary and social work. In addition, at the urging of graduates of Victoria in missions in the Orient, he and his wife made an extended tour in the spring of 1913 to Japan, where he attended two Methodist conferences, and delivered lectures at the Tokyo Imperial University and the Kwansei Gakum, a mission school near Kĩbe. Burwash’s enduring influence, however, does not lie mainly in his theology, which by the time of his death was seen by some of his colleagues to be dated. He had, for example, already in the early 1880s encountered resistance to his position on infant depravity and the continued need for the conversion of children at a time when many were moving towards a new view of childhood innocence. This doctrinal conservatism, manifested in his concern to retain what he considered to be the evangelical core of Wesley’s theology, was paired, however, with an openness to new scholarship. Methodist spirituality, especially Wesley’s doctrine of holiness, was for him the basis which his students could use to develop liberal positions with regard to social change and critical thought. As a result, a younger generation of socially minded Methodists, such as his student James Shaver Woodsworth*, were able to draw on their religious tradition to articulate the principles of a new social Christianity, even when they were no longer able to accept the old form of Methodist piety. Burwash had been, as well, one of the principal forces in reshaping Ontario’s university system. His suggested division of labour at the University of Toronto between the denominational colleges and the university remained virtually intact until 1974, long after the evangelical vision which had prompted it had been forgotten. In addition to the works mentioned in his biography, Nathanael Burwash’s publications include Memorials of the life of Edward & Lydia Jackson (1876), “The genesis, nature and results of sin . . . ,” the lecture in Victoria College, Theological Union, First annual sermon and lecture (1878), and The relation of children to the Fall, the Atonement, and the church (1882), all issued in Toronto, as well as an essay in the pamphlet Queen’s University and the university question (n.p., [1903?]). His edition of John Wesley’s standard sermons appeared under the title Wesley’s doctrinal standards; part i: the sermons (Toronto, 1881). In addition, Burwash was a frequent contributor to the Canadian Methodist Magazine (Toronto and Halifax) and to the Canadian Methodist Quarterly (Toronto), 1889–93 (renamed the Canadian Methodist Rev. for 1894–95), which he helped found. The author’s study An evangelical mind: Nathanael Burwash and the Methodist tradition in Canada, 1839–1918 (Kingston, Ont., 1989) refers to other works by Burwash and contains as well a full bibliography of manuscript and printed sources. The most important archival source is the Nathanael Burwash fonds at Victoria Univ. Arch., Toronto (Fonds 2042), in particular the autobiography begun by Burwash shortly before his death, and biographical notes by his son Edward M. Burwash, in boxes 27 and 28. There is a good sketch of Burwash by Kaatherine Ridout in the 1982 finding aid to the collection (no.517). P. D. Airhart, Serving the present age: revivalism, progressivism, and the Methodist tradition in Canada (Montreal and Kingston, 1992). Michael Gauvreau, The evangelical century: college and creed in English Canada from the Great Revival to the Great Depression (Montreal and Kingston, 1991); “The taming of history: reflections on the Canadian Methodist encounter with biblical criticism, 1830–1900,” CHR, 65 (1984): 315–16. A. B. McKillop, A disciplined intelligence: critical inquiry and Canadian thought in the Victorian era (Montreal, 1979). On the old Ontario strand: Victoria’s hundred years . . . (Toronto, 1936). Tom Sinclair-Faulkner, “Theory divided from practice: the introduction of the higher criticism into Canadian Protestant seminaries,” Studies in Religion (Waterloo, Ont. ), 10 (1981): 321–43. C. B. Sissons, A history of Victoria University (Toronto, 1952). R. J. Taylor, “The Darwinian revolution: the responses of four Canadian scholars” (phd thesis, McMaster Univ., Hamilton, Ont., 1976). [F. H.] Wallace, “In memoriam, Chancellor Burwash,” Acta Victoriana (Toronto), 42 (1917–18): 355–63; “In memoriam: Rev. Nathanael Burwash . . . ,” Victoria College Bull. (Toronto), no.12 (1918–19): 59–65 and photo on frontispiece. Marguerite Van Die, “BURWASH, NATHANAEL,” in Dictionary of Canadian Biography, vol. 14, University of Toronto/Université Laval, 2003–, accessed April 20, 2019, http://www.biographi.ca/en/bio/burwash_nathanael_14E.html.